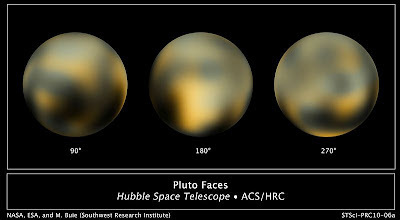 Something I found out today: New Horizons has provided us with a date from which it will be able to send us images at a resolution better than the Hubble Space Telescope, currently the provider of the best images we have to date. The Better Than Hubble date is exactly 5 May 2015, two months and nine days before closest approach (14 July). After that there are two more months of better than Hubble resolution as New Horizons turns back to observe Pluto from behind. Originally I had assumed two things: 1) better than Hubble would be about two weeks given its high velocity (14 km/s), and 2) the mission did not bother to specify when this period would begin. This Better Than Hubble date is a great piece of information to include on a mission page. Dawn could use it too, for example: with an arrival date at Ceres of February 2015 we should be able to see it at better resolution some two months before, but the exact date is hard to tell. One could make some rough calculations (take the distance 70 days before arrival and factor in visible surface area of Pluto vs. Ceres, plus albedo) but I'd rather just bug the Dawn team to make sure.